You can make flower arrangements by yourself. 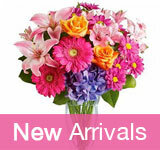 This page gives you some basic information about how to make flower arrangements on your own. The special focus will be on rose bouquets. According to Connie Krochmal, floral design editor with Bella Online, the basic rule of flower arrangement is Â“follow your instinctÂ”. The idea is that you choosing a flower of your liking and a color of your preference will naturally result in gorgeous designs. There are many people who have the potential to be really good at flower arrangement although they do not do it. People do not realize it because they have not tried to. The fact that it is an expensive hobby might discourage people from pursuing their interests in flower arrangement. If you buy from supermarket floral sections and discount stores and use flowers of evergreen plants like hydrangea for your arrangements, you can be sure that your flower arrangement budget does not exceed the limits. Now we move to making rose bouquets. 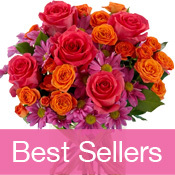 Given below is a simple step-by-step procedure for making a rose bouquet. Once you have mastered one type, it will be relatively easy for you to learn to make other types as well. Step 1: Take 12, 24, or 36 roses. Step 2: Hold three roses in your hand in an almost triangular shape, about 6 inches from each other. 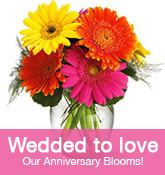 Keep them in slightly different levels to make the bouquet look like a nice, big bunch. Step 3: Add a rose to each of the roses you have in your hand so that you have a bigger triangle. Again vary the heights. Step 4: Add two roses on each of the three sides. Now the whole bunch would look as if it has a circular outer edge. Step 5: Add more roses according to your sense of completeness. Put roses in a circular manner around the already formed edge. Step 6: Wrap the bunch of flowers around the stems using a tape. Step 7: Cover the tape using a ribbon. Step 8: Cut the stems an inch below the ribbon using scissors. Step 9: Place the bouquet in a container of water, making sure that the ribbon does not get wet. Slightly moisten the flowers and keep the bouquet in a reasonably cool place. We end with a general note about how to make your flowers (not necessarily roses) live longer. For longevity of flowers, the vases should be clean. Use fresh and mildly warm water and add cut flower food available from market. Remove all the leaves below the water level. Snip off 3 centimeters from every stem by an angled cut using a sharp scissors and take out faded flowers as they come about. It is important not to expose the flowers to direct sunlight or heat. Replenish the vase with sufficient water as required with proportional supply of the flower food.